Book News: Honolulu, Chicago Campaign To Host Obama's Presidential Library : The Two-Way Also: English town may ban apostrophes on street signs; feminist romance novels; and Marie Ponsot wins the Ruth Lilly Poetry Prize. 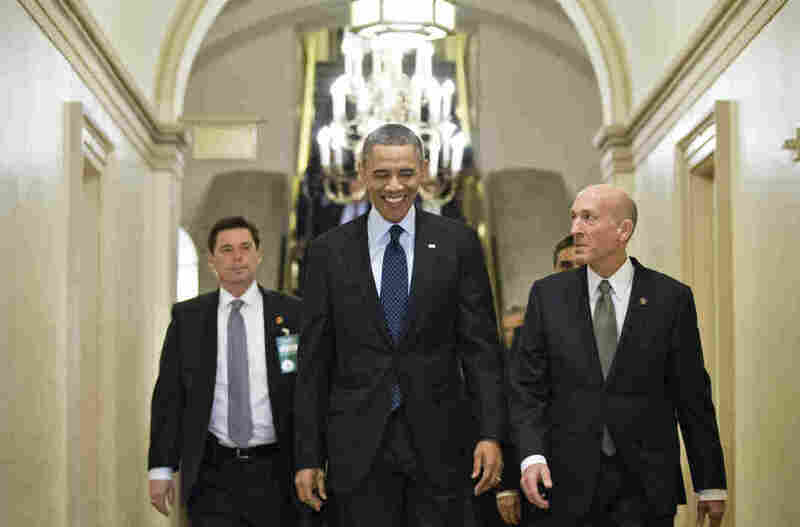 President Obama arrives on Capitol Hill earlier this month. Honolulu and Chicago are vying to be the site of President Obama's Presidential Library, according to The Associated Press. Although Obama's second term has barely started, representatives the University of Chicago and from the University of Hawaii have begun visiting other presidential libraries. In fact, the University of Hawaii already has a spot set aside. The BBC is selling Lonely Planet to NC2 Media — for much less than it paid for it in 2007. Flavorwire collects fan letters from famous authors to other authors (and one anti-fan letter, from William S. Burroughs to Truman Capote: "You have betrayed and sold out the talent that was granted you ..."). The best might be Charles Dickens' note to George Eliot: "The exquisite truth and delicacy, both of the humour and the pathos of those stories, I have never seen the like of; and they have impressed me in a manner that I should find it very difficult to describe to you, if I had the impertinence to try." A county in the U.K. is looking to ban apostrophes from its street signs. American poet Marie Ponsot will be awarded the $100,000 Ruth Lilly Poetry Prize, the Poetry Foundation announced Monday. The editor of Poetry Magazine said in the announcement that "T.S. Eliot once said that modern poets had lost the ability to think and feel at the same time. If only he could have read Marie Ponsot!" For The Atlantic, Jessica Luther asks whether romance novels can be feminist: "The very discussion about where women derive pleasure and why is a feminist project."